A female jaguar yawns at the Montgomery Zoo in Alabama. A three-year-old male jaguar named Valerio escaped its enclosure at New Orleans’ Audubon Zoo on Saturday and was successfully sedated and captured, but not before it managed to maul and kill several alpacas, an emu, and a fox, CNN reported. According to the Times-Picayune, all five alpacas from the zoo’s all-female herd kept within the Jaguar Jungle complex have died, while two foxes are injured but have survived. The first fox, named Copper, is in critical condition, but its counterpart Rusy is in better shape. The paper reported that a preliminary investigation found evidence that Valerio’s enclosure had a “compromised” roof and that the incident was not the result of keeper error, though a full investigation is pending. 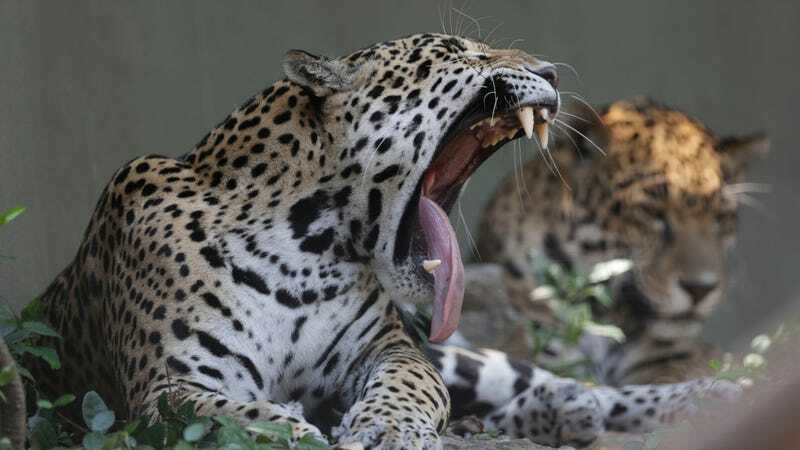 The Mercury News reported that Valerio’s behavior is not atypical of jaguars, which are highly aggressive, opportunistic apex predators, and that Burks described its reaction as a territorial display, with the other animals unable to escape their own enclosures. While it’s worth emphasizing again that no humans were harmed, the Jaguar Jungle complex is home to a children’s play area, and accidents of this nature are statistically inevitable when housing predatory animals. Instances of animals escaping or unauthorized humans entering their enclosures tend to be rare, though, according to the AP.